We begin today at Doomben on a Good 4 track with stable rider Patrick Moloney aboard all of our runners. Alaskan Rose kicks us off in the listed Radiotab The Wayne Wilson (1600m) event jumping from barrier 2. She comes off a last start run at Eagle Farm where it was difficult to get any true line on her due to the controversial track and conditions. We expect the mile to suit her, the 1300m last time out was likely short of her best. She is a solid chance in this field. Top Of The Range (pictured) holds nominations for both the Gp.2 Ascot Green Queensland Guineas (1600m) and the Gp.1 Channel Seven Queensland Derby (2200m) though he would need three scratchings to make the Derby field. At this stage, he is a likely runner in the Guineas which is a step back in class for him. Again, as with Alaskan Rose, it was tricky to get any sort of line following his last start due to the Eagle Farm track and conditions. He is a classy horse with stacks of ability and has winning form over the mile so he would have to be a serious contender here. Yesterday’s Songs holds a nomination for the Gp.1 UBET Stradbroke Handicap (1350m) though is an unlikely starter as he would also need three scratchings to make the field. He instead will be aimed towards the Eyeliner Stakes at Ipswich the following week. 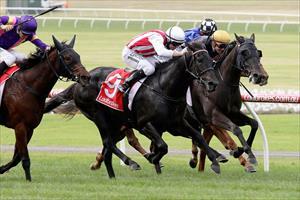 At Flemington, we have two runners in the Rod Johnson Handicap (1400m) on a Soft 5 track. Radipole jumps from barrier 5 with Brian Higgins aboard. He did over-race first up and has since had a jumpout and is improved and fitter leading into this event. He meets a strong field, though we expect a good run from the nice draw; he is a talented galloper and a win would not surprise. Loyalty Man jumps from barrier 12 with Jake Bayliss aboard. Has trialled up superbly and comes in great order. He is a very forward type and if the race maps out in his favour from that tricky draw a win would be no surprise. On Sunday at Hawkesbury, on a Heavy 9 track, Grand Teton rounds off the weekend when he lines up in the Irresistible Pools and Spas Maiden Plate (1800m) jumping from barrier 7 with Koby Jennings aboard. This is a galloper on the improve and looking to clear his maiden. We anticipate him putting himself into the race from that draw and so long as he gets around right handed, he is a good each way chance.